Clear skies with a few passing clouds. Low 43F. Winds SSW at 5 to 10 mph. The best thing to do when sick is stay home and recover. Even if you don’t make audible the “ah-choo,” it is easily identified as a sneeze, and everyone knows you have done it. Now we have to stifle that sneeze, apologize for the noise and the disturbance and we must quickly follow with an “excuse me.” We even have to make up a story about having allergies or just a tickle in our nose. In the past, others might have accepted your explanation. Today, that is received with doubt, since recent events have put everyone’s truth-o-meter in permanent overdrive. Why the shift in sniffling protocol? Sick shaming. And it is everywhere. Handing someone a box of tissues or vitamin C supplements isn’t enough to keep the entire office from getting whatever it is, so short of spraying colleagues with disinfectant or passing out hazmat suits, the solution is isolation or removal. 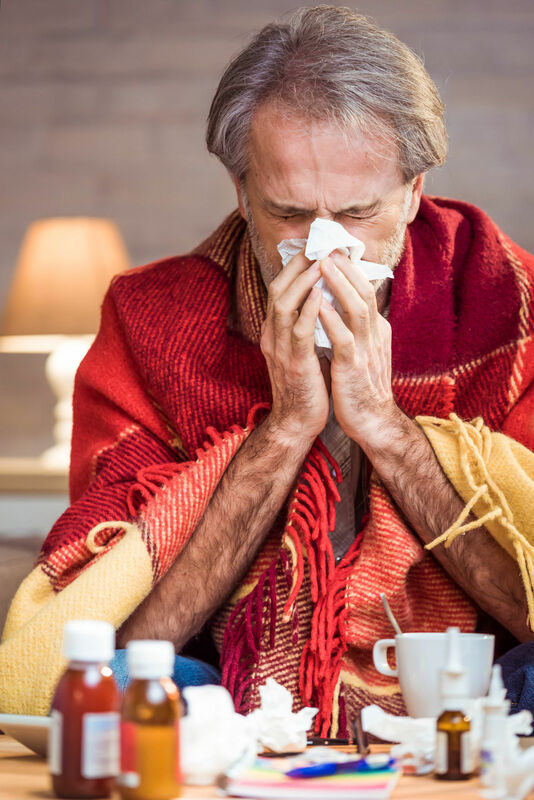 As harsh as that sounds, even non-germaphobes are taking illness seriously and precautions are necessary to prevent a total outbreak throughout a building. Masks are the new scarves and keeping a distance is not just because of the #MeToo movement. Flu viruses rudely continue to add strains to the influenza A and B types, so inoculations aren’t always fail-safe. The 24-hour flu often extends its stay with the host long beyond the fish metaphor for unwanted guests. One reason people go in to work while under the weather is not all companies offer paid sick leave. Taking time off means a smaller paycheck. That means greater stress at the end of the month than the small inconvenience of being tired, headachy, and feeling the overall malaise for a few days at work. Some people just love their job and know they can get work done in spite of coughing and sneezing. Many people want to be present, and stoically continue on. They don’t take into account the fact that the noise alone disturbs other workers. Without being germaphobes, others may not appreciate exposure to whatever it is you bring in to work. You might tend to tough it out and tell yourself that you are not that sick or you are almost over it or a little DayQuil will do the trick. You might even say it’s nothing when it really is something. That something can turn into something else if not properly taken care of. The truth is, nobody likes seeing all your Kleenex on your desk and nobody enjoys the blood-curdling sounds coming out of your throat during morning meetings or while they are on a call. Being sick is nothing to be ashamed of. If you have children, go to the grocery store, or even shake hands with a client, you already have been targeted and there is little you can do about it. Not to be an alarmist, since I am one of those who say it must be allergies, but take it seriously. Sniffles may seem innocent enough until they turn into life-threatening illnesses. You can, however, spare your co-workers the same dilemma simply by staying home, getting some rest, and doing all the things on the list of things to do for colds and flu. They don’t make that stuff up. Plenty of liquids, healthy food and rest are a good start. Use the prescribed medicine, take something for the fever, and whatever you do, don’t decide to share it with the immediate world.